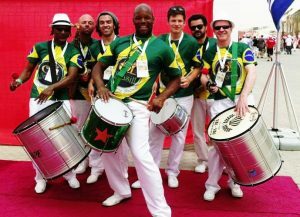 Brazilian Drummers and Dancers for hire. 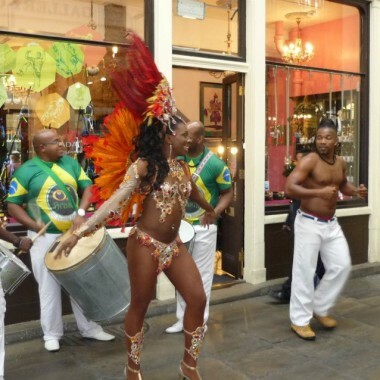 Viramundo Drummers and Dancers are a Brazilian troupe performing samba, salsa, lambada, merengue, bossas, with spectacular costumes for carnival, mulata, capoeira (Brazilian martial art dance) or batucada (mobile drum-based samba). 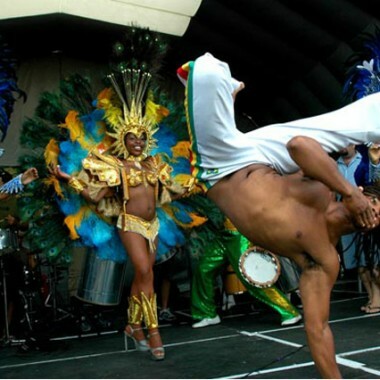 Viramundo Dancers are a Brazilian dance troupe performing samba, salsa, lambada, merengue, bossas, with spectacular costumes for carnival, mulata, capoeira (Brazilian martial art dance) or batucada (mobile drum-based samba). The name Viramundo is synonymous with the best in Brazilian music and dance and comprises a five to eight piece music group and a two to six piece dance troupe (or larger). The music group is led by vocalist, guitarist and cavaquinho player Paul Paulinho, and he has put together a potent mix of South American and European musicians giving the unique sound of Viramundo. 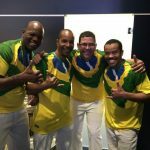 That special rhythmic swing is provided by two top Brazilian percussionists, Edson Ribeiro and Xavier Osmir (from Bahia and Sao Paulo) who, together with the bass and drums of Andres Lafone and Davide Giovannini (Latin’s Sly & Robbie), provide the engine of the band’s sound. Longtime horn partners John Harborne and Steve Buckley (trombone and sax respectively) and the most recent addition, multi-instrumentalist, composer and singer Brazilian born Kaw Regis, make up the octet. Viramundo has been nearly ten years in the making, looking for that right blend of musicians and personalities and cutting their teeth in the Latin clubs playing the latest sambas, salsas, Lambadas, merengues, Bossas and Axe music. Always known for their versatility and variety of repertoire, the band has recorded several CDs containing original compositions and sung by four main members: Paul, Kaw, Xavier and Edson. 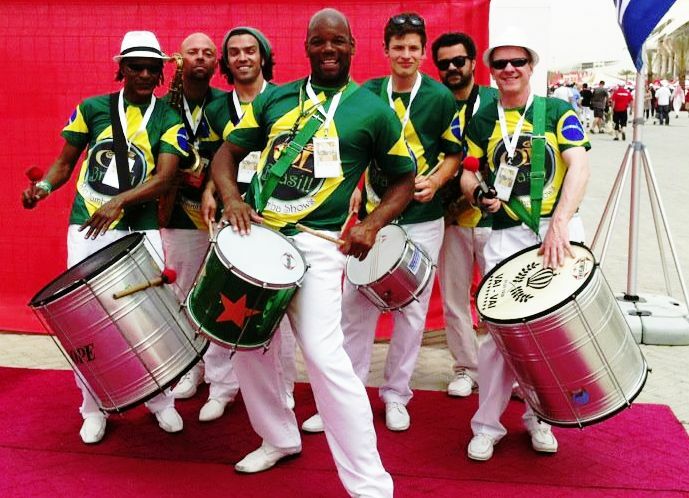 The Viramundo drummers and dancers are particularly effective at sporting events. 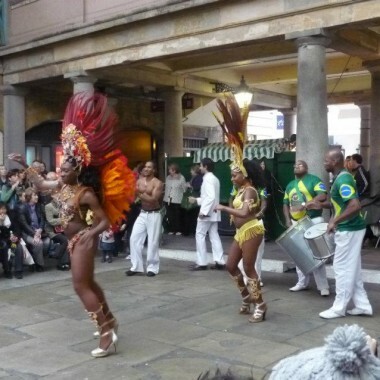 Viramundo Brazilian dancers for hire, has played a wide range of festivals, functions and clubs in Europe including Gran Gran Fiesta, Henley Festival, Notting Hill Carnival, numerous university balls, top hotel functions at the Hilton, Carlton, Savoy etc., benefits for Friends of the Earth, Amnesty International, Greenpeace and Latin clubs (Bahia, Bar Tempo, Bass Clef, HO, 100 Club, Salsa, Yes Brazil etc.). UK TV appearances include Good Morning, The Big Breakfast and London Tonight. The band is also available for international bookings having successfully spent a three month residency in Singapore’s top nightspot, Fabrices, where they also recorded TV broadcasts. Viramundo were very proud to be called to play for Madonna when Versace organized a party for the launch of Evita in London in December 1996. And when Mick Jagger wanted a Brazilian band for his birthday party a few years ago, the first band he called was Viramundo. 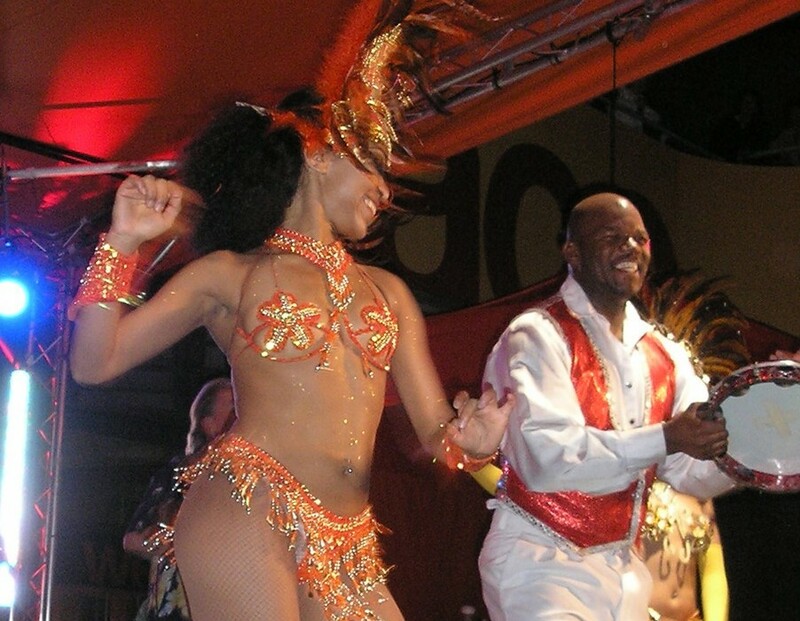 The group’s most stunning performances have been in conjunction with their own dance troupe, featuring spectacular Carnival costumes, sensual mulata dancers, Capoeira (Brazilian martial art dance), Lambada, Afro Brazilian dance, Brazilian North Eastern folkloric and much more. The dancers were featured on BBC1’s Generation Game and also appear on the interactive CD from Peter Gabriel’s Real World Company. 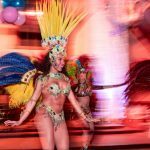 To sum up, the band provide the best in original Brazilian dance music and combined with the dancers, provide a visually stunning show full of colour, energy, sensuality and above all a contagious spirit that makes even the shyest jump out of his seat and join the fun.